One of the services OJCF provides to donors is the ability to process complex transactions for charitable giving. 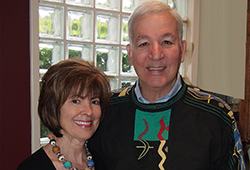 Jerry and Bunny Sadis are dedicated OJCF fund holders who had the innovative idea to gift their interest in a portion of an LLC to their donor advised fund. The LLC owns real estate investment property that is in the process of being liquidated. The resulting funds from the portion of the donated interest will allow the couple to realize the proceeds for their family's philanthropic fund. "Bunny and I are thrilled that we could partially prefund our legacy gift to the community through the OJCF," says Jerry. "Although the transaction was complex, the staff made every effort for us to achieve our goal. We have been pleased, over many years, to have a donor advised fund with OJCF to help facilitate our donations to the Jewish Community." Jerry and Bunny have been part of the OJCF family for nearly 20 years. Jerry served as OJCF's president from 1998–2000 and on OJCF's Board of Directors from 1993–2005 as representative for the Jewish Federation of Greater Portland. During his time as president, Jerry established OJCF's Strategic Planning Committee, spearheaded the first OJCF planned giving forum that was attended by representatives of 20 local Jewish agencies and was instrumental in increasing foundation assets by more than 20%. OJCF is very honored to have Jerry and Bunny as long-time supporters.